the canDIshhh tales: City Chef: Chef prepared meals for you the family! City Chef: Chef prepared meals for you the family! Nope, it's not those calorie counted meals, not is it the Keto ones. This one is the modernized *tiap tsai* or *ulam delivery*. Their service is to bring food to you, lunch and/or dinner with 2 viands and and rice. A few years ago, a newly married friend of mine was so happy she solved a problem. Well, she was newly married, she didn't know how to cook nor did she hire help because they lived in a condo. She was honestly worried what to serve her husband but then friends of her suggested a food delivery service. She only needed to *serve* dinner as they had work during the day (kanya kanyang kain nalang) and it was perfect. The food was delivered the night before and all she needed to do was re-heat everything. She was so happy with the service that I think this went on for about nearly a year. She told me that this was such a lifesaver for her. She didn't need to worry about the food the next day, didn't need to go to the supermarket often not did she need to *learn* to cook. I had this in mind when I got married, but since I knew how to cook - well, I didn't need to. Fast forward to the present. Well, with the problems of having no house help (at times), having a day job and two to take care of two kids, my Panget and the household. Cooking has become something of a chore for me, oftentimes I would suggest to my Panget to just buy *ulam* in QC sports that we can freeze and re-heat when needed. City Chef offers delivered meals right at your doorstep. No need to go out and buy food. Just order online, pay and wait. Convenient right? I wish I knew of them last year when I was in need of *cooked meals*. I would have ordered from them for weeks. Food was delivered before 6PM which was great, since we eat by 7pm the latest. The food is packed well in reusable microwavable containers. I like it because all you need to do is pop it in the microwave and voila - heated dinner! On our first night it was Steamed Garlic Kangkong and Beef Adobo Flakes. I liked the steamed kangkong because it wasn't too salty, the cook was just right because there was a crisp in the bite. The kids loooooved the Beef Adobo Flakes because it was crunchy, it was their first time to eat an all crunchy *ulam*. The meal came with white rice, it was really fragrant - Yaya B said it had a hint of pandan, but I couldn't tell the difference. Gutom na kasi. Serving was a good portion for us 2 adults and 2 kids. But if your kids are much older than mine (mine are 5 and 6), with a big appetite, the serving might be too small of everyone. The site says that the servings are good for 2-3, so in my family's case - it was just enough. For the next night, it was Pumpkin Soup and Burger Steak with Mushrooms. I love love pumpkin soup and I was so happy that it was really good! They did not scrimp on the bacon in the soup, but in my opinion this was only good for 2. I chose not to share this with the kids as I really loved it. Hahaha!! The burger steak was just okay according to my Panget, he wished there was more gravy. We were surprised that it has 4 patties, more than enough right? They also have a SOLO serving that is probably good for one. 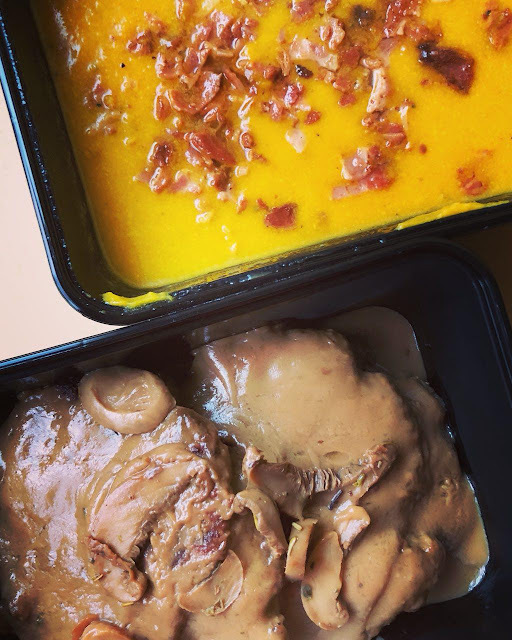 So if you're a very busy body, well - order away and have chef prepared meal delivered right at your doorstep. For the family serving, their daily rate is P490.00 and their 5-day rate is P450.00/day. When you think about it, it comes out at P225.00 per dish, not so bad when you compare it when you eat out, right? 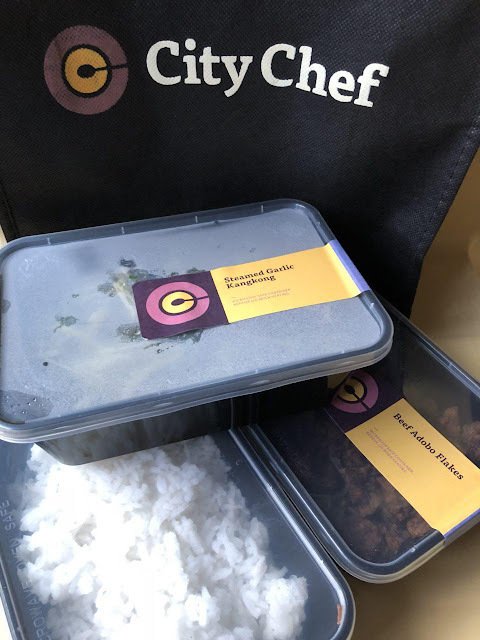 Visit www.citychef.ph to view their menu and to order! Thank you too Krissy! We enjoyed the meals. A personal chef will meet with a client and customize a meal plan by determining how often the service will be provided and the number of meals cooked each time. The client will typically choose various meals and sides from the chef's menu, then the chef will shop for all groceries, prepare the meals on a designated "cook date" in the client's home. hire a personal chef for your party.